I know Lake already named Noelia the baddest chick at UvT. I guess you just bypassed Kim Kardashian, Jessica Biel, Jessica Alba, Asia Nitollano, Jen Johnson from Big Brother, Allison Stokke, Mel B, that young babe Akon hunched on stage, and Erykah Badonka-Badu. Fine, I was slackin’ on my pimpin’ and didn’t get my vote in on time. I even hear this Noelia has a tape out there that I might want to see. Whatever, you know Brock is about bringing fresh blood into the mix, so I give you Zoe Kravitz. Yes my friends, that is what you get when you mix a rocker and the weird chick from the Cosby Show and Different World. 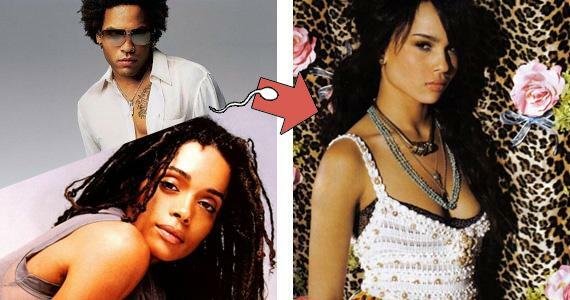 Lenny Kravitz and Lisa Bonet got together in the late 80’s and this is the result. I like it, and she just keeps on getting badder as she gets older. Add her to the watch list. I hear she is trying to act, she’ll probably try to release an album, and I don’t doubt that she is on that stuff in some shape or form. All I need her to do is stay fine. And if you didn’t know, she gets it from her momma.